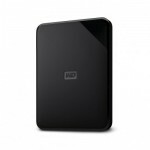 WD Elementsâ„¢ SE portable storage offers high-capacity to go, fast data transfer rates and universal connectivity with USB 2.0 and USB 3.0 devices. The small, lightweight drive features up to 4TB of storage with WD quality and reliability. Get compatibility with USB 3.0 computers and backward compatibility with USB 2.0 computers in this single drive. When your internal hard drive is almost full, your PC may slow down. Donâ€™t delete files. Instead, free up space on your internal hard drive by transferring files to the WD Elements SE portable storage to get your laptop moving again. WD Elementsâ„¢ SE portable storage with enclosure is built to meet WD's demanding requirements for durability, shock tolerance and long-term reliability to help protect the data that's important to you. The small, lightweight design of WD Elements SE portable storage offers up to 4TB capacity, making it an ideal, on-the-go companion to take files with you. WD Discovery software helps manage WD Drive Utilities (sleep timer, LED control) and disk formatting. Formatted NTFS for WindowsÂ® 10, Windows 8.1, Windows 7. Reformatting may be required for other operating systems. Compatibility may vary depending on userâ€™s hardware configuration and operating system.